An important characteristic of a company is that its shares are transferable. Shares or debentures are movable property. They are transferable in the manner provided by the articles of the company, especially, the shares of any member of a public company. 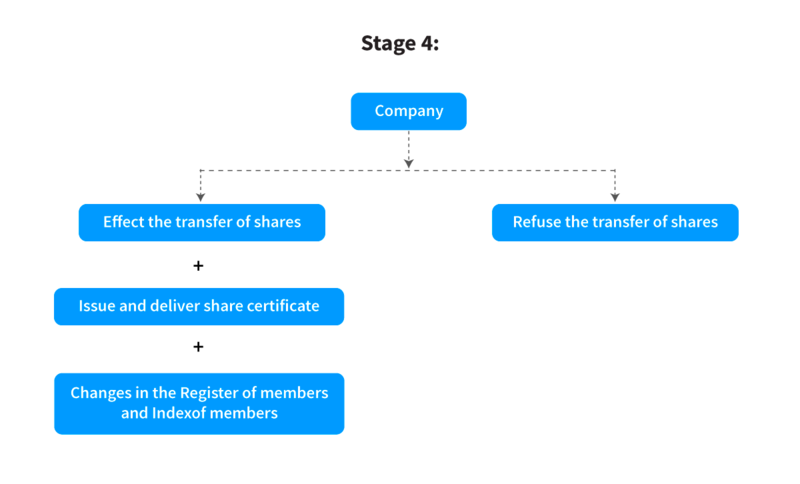 A private company is required to restrict the right to transfer of its shares in ts articles. With respect of the transfer of securities, any contract or arrangement between two or more persons shall be possible through a contract. The provisions of the Companies Act deals with transfer and transmission* of securities. *Transmission of securitie means loss of title on these securities due to death, succession, inheritance, bankruptcy etc. In short it is something other than transfer. Transfer of shares means the voluntary handing over of the rights and possibly, the duties of a member (as represented in a share of the company) from a shareholder who wishes to not be a member in the company any more to a person who wishes of becoming a member. Thus, shares in a company are transferable like any other movable property in the absence of any expressed restrictions under the articles of the company. Legal Representative, in case of a deceased. Firstly, the transfer deed needs to be obtained in the prescribed form i.e. Form SH-4, endorsed by the prescribed authority. viii. Trustees who have filed the declarations. d. For transferring debentures, a standard format can be used as the instrument of transfer. Get the Articles of Association in case of shares, trust deed in the case of debentures and transfer deed registered either by the transferor and the transferee or on their behalf in accordance with the provisions of the Companies Act, 2013. According to Indian Stamp Act and stamp duty notification in force in the state concerned, the transfer deed should need to have stamps. The present stamp duty rate for transfer of share is 25 paise for every one hundred rupees of the value of the share or part thereof. That means for shares valued Rs. 1050, the stamp duty will be Rs. 2.75. Check that the stamp affixed on the transfer deed is cancelled at the time of or before the signing of the transfer deed. A person who gives his signature, name and address as approval for transfer must see the transferor and the transferee sign the share/debentures transfer deed in person. The relevant share/debenture certificate or allotment letter with the transfer deed must be attached and sent to the company. 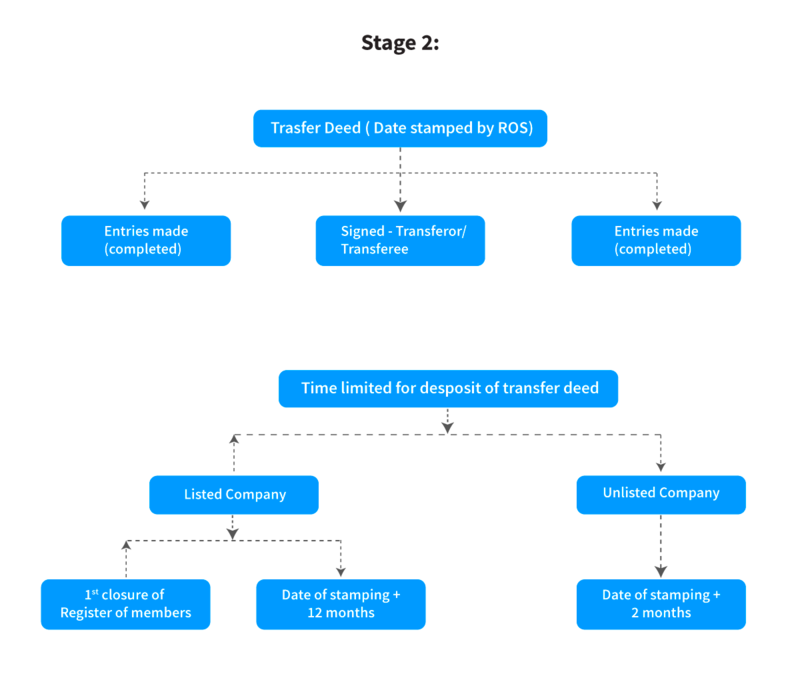 In case the application made by the transferor, is for partly paid shares, the company has to duly notify the amount due on shares/debentures to the transferee. Also, a no objection from the transferee is required within two weeks from the date of receipt of the said notice. Affix the same value stamp on a written application if signed transfer deed has been lost. In this case, the board may register the transfer on specific terms of indemnity as it thinks fit. If the shares of the company are listed in a recognized stock exchange, then the company cannot charge any fee for registration of transfers of shares and debentures. Till the transferee has given a no objection certificate to the transfer within two (2) weeks from the date he recieved the notice from the company. A Company having share capital:- The Company shall not register transfer of securities of the Company or member’s interest in the Company other than beneficial owners without a proper instrument of transfer within a period of 60 days from the date of execution. Application by transferor alone:- The transfer shall not be registered until and unless the company gives notice of the application to transferor and transferee gives no objection certificate within 2 weeks from receipt of the notice. In case of subscribers to memorandum – within a period of 2 months from the date of incorporation. In case of allotment of any of its shares – within a period of 2 months from allotment date. Receipt by the company of the instrument of transfer/ intimation of transmission – within a period of 1 month from the date of receipt. Allotment of debenture – within a period of 6 months from the date of allotment.